Last month Canadians celebrated being the citizens of a country for having best – #1 quality of life. It’s a remarkable milestone. A milestone which all Canadians can take pride in. January is also a gruesome reminder for all Canadians that terrorism remains the biggest threat of the twenty-one century, and it has no religion. As we commemorate the death of six Canadian Muslims who were gunned down in a Quebec City mosque, by a young man, a right-wing extremist, Alexandre Bissonnette, who was wrongly influenced by right wing agenda of hate and discrimination. On January 29th, 2017 the Alt-Right seemingly won, as the mosque attack pushed Canada up nine points on Global Terrorism ranking. However, alt-Right lost, as the attack on Canadian Muslims brought Canadians together. Since then, each Canadians come together to commemorate the deaths of six Muslims victims who lost their lives that night in a place of worship. There’s no doubt, hate crime in Canada is on the rise. Hate crime targeting Muslims were up 151% in 2017, according to Stats Canada. Many attributes this rise to former Conservative government of PM Harper and their right-wing divisive agenda against minorities, particularly against Canadian Muslims. Therefore, political leadership does have the power to set the agenda whether its inclusive or divisive. They are responsible for setting the tone. For that purpose, we can certainly say, PM Trudeau has worked diligently to subdue the poisonous anti-minority, anti-Muslim rhetoric of the former Conservative government. We can say for now, Canada is headed in the right direction under PM Trudeau regarding setting the stage for an inclusive Canada for all Canadians. Clearly, Quebec Premier, Mr. Legault is in denial or he hasn’t read the State Canada report on 2017 Hate crimes in Canada. After Ontario, Canada’s most populous province. The report concluded, “Quebec reported a 50% increase in hate crimes, rising from 327 to 489. The increase was the result of crimes against the Muslim population, which almost tripled from 41 in 2016 to 117 in 2017. Reports of hate crimes against Muslims peaked in February, the month following the mass shooting at the Islamic Cultural Centre of Québec and accounted for 26% of Quebec's annual reported incidents targeting Muslims.” Quebec City mosque attack is deemed as the deadliest terror attack on Canadian soil. Despite such glaring facts Premier Legault still managed to muster the courage to deny Islamophobia. Add insult to injury, Mr. Legault made such deplorable comments two days after the second anniversary of the deadliest attack in his province’s capital. However, Canadians should not be surprised at such comments by Quebec’s Premier. It seems as if half of the province is in an absolute denial on the existence of racism in their province. “What explains this regional divide? Demographer Jack Jedwab, the president of the Association for Canadian Studies, suggests simply talking about racism is a touchy issue in Quebec. "In Quebec, we saw considerable resistance to the very idea of having a consultation about systemic racism," Jedwab said, out of concern that it might give rise to "Quebec bashing." Quoted CBC. 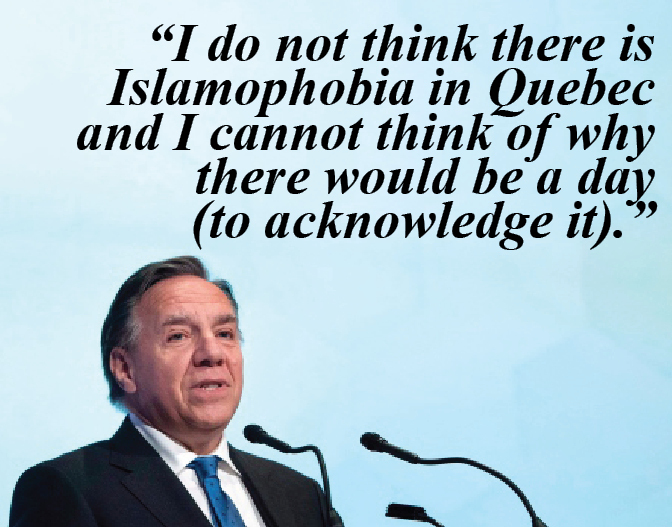 Basically, what it seems, for fear of having his province being labelled as “racist” or avert “Quebec Bashing” Quebec Premier’s solution seems to be simple – deny the existence of racism and Islamophobia in his province altogether. Canada is respected around the world for its leadership, with or without recognition, based on not only how it treats its citizens, but how it treats citizens of other countries, for its humanitarian efforts, for its assistance to other nations, its UN Peace Keeping efforts, and for being a good global citizen. It is due to extra-ordinary leadership set forth by current and past leaders. All elected leaders have a duty to uphold this time-honoured traditions. So, when an elected official, especially a Premier or a PM acts in a manner that contradicts our Canadian traditions we have an obligation to stand up and speak out, even if it is against our own selves, to protect our status as a global leader in a field that matters the most – Respect for Humanity – Respect for all Cultures and Religions. The NCCM recently released an open letter, endorsed by over 100 Muslim organizations, faith-based groups and civil society allies, to the federal government asking for January 29 to be designated as a National Day of Action Against Hate and Intolerance. We urge all Canadians to reach out to their federally elected officials and urge them to consider the designated a National Day of Action Against Hate and Intolerance and make Canada a global leader in fighting racism and discrimination and hate base crimes at home and abroad.